The inflation rate most widely followed is the consumer price index, but the personal consumption expenditures index is what you should be following. Every month the media fawns over the consumer price index. 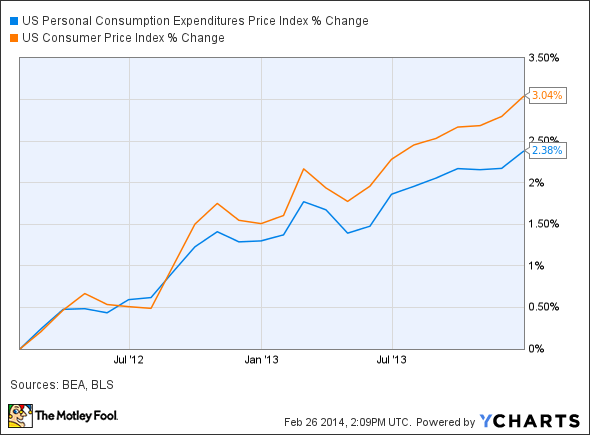 But the personal consumption expenditures, or PCE, inflation rate is what you should be paying attention to. It's the measure the Federal Reserve follows for economic policy, and it's updated to reflect consumer spending more frequently than the consumer price index, making it a better measure of real-time inflation. 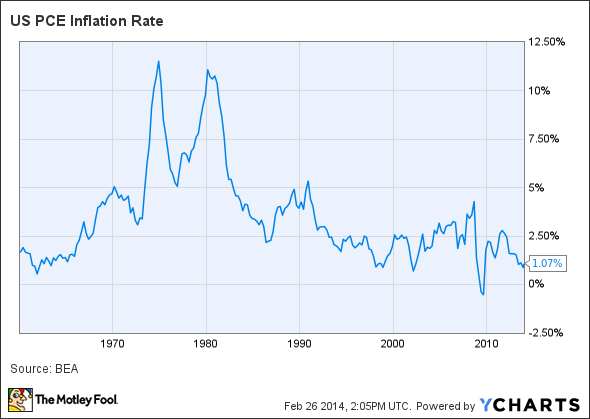 Inflation is the rate of increase in the prices of goods and services, and it's reported as a percentage change. As prices increase, the "purchasing power" of your money decreases -- i.e., your money is able to purchase less. While the PCE inflation rate is reported monthly, economists generally look at the change over 12-month periods, as the month-to-month data can be noisy. As an example, if the inflation rate were 2%, then you would need 2% more money than you did a year ago to buy the same basket of goods and services. The personal consumption expenditures inflation rate is just one method to track the inflation rate; others include the consumer price index and the core inflation rate. The personal consumption expenditures inflation rate is reported each month by the Bureau of Economic Analysis as part of the Personal Income and Outlays report; a full schedule of future release dates can be found here. The PCE is meant to be one of the most accurate measures of inflation, because it updates the goods and services that it measures monthly. 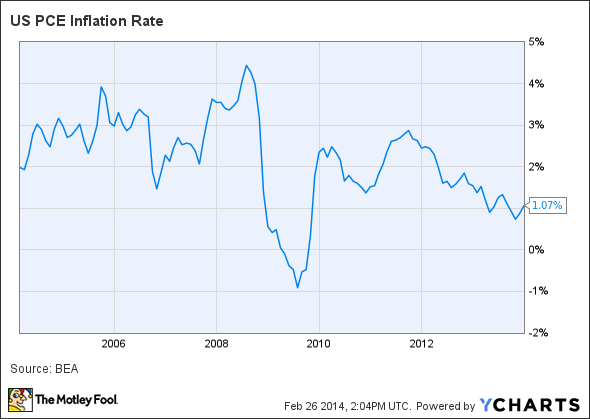 The Federal Reserve generally targets annual inflation of 2%. Lately, though, inflation has been running well below the Fed's target. U.S. PCE Inflation Rate data by YCharts. Inflation is dangerous, as it eats away at investors' hard-earned savings; each year, your dollar is worth less as prices rise. While inflation hasn't been much of an issue the past few years, older U.S. investors still remember the damaging effects of inflation when it was much higher. US PCE Inflation Rate data by YCharts. The formulas used to calculate inflation are different in each case. The big point is that the weights in the PCE change as people substitute away from some goods and services toward others on a month-to-month basis, while the CPI basket is fixed for two years, which can lead to an upward bias for the CPI. To get monthly data on changes in purchases, the PCE uses the data from multiple business surveys, including the Census Bureau's annual and monthly retail trade surveys, the Service Annual Survey, and the Quarterly Services Survey. On the other hand, the CPI is based on a household survey done every two years by the Census bureau. The PCE basket is more comprehensive than the CPI basket. The CPI only includes out-of-pocket expenses, while the PCE includes services that are used by consumers but paid for by someone else. A good example is health insurance payments to doctors; the CPI only includes the out-of-pocket expense, while the PCE includes the amount your insurance company paid. The Federal Reserve believes the PCE inflation rate is a more accurate measure of inflation, and investors should note the effect of using the PCE. Generally, the PCE inflation rate runs slightly below the CPI inflation rate. In the past two years, for example, the CPI finished up 3%, while the PCE was up only 2.4%. U.S. Personal Consumption Expenditures Price Index data by YCharts. While it may not seem like much, if Social Security benefits or Treasury inflation-protected securities were indexed to the PCE instead of the CPI, it would mean billions less for the holders. Besides providing a more accurate view of inflation, the PCE inflation rate is also one of the three key variables that the Federal Reserve is watching as it continues the drawdown of its quantitative easing and decides what to do with the federal funds rate. The other two are economic growth and the level of unemployment. As part of the Fed taper goes, the Fed has said it is aiming for PCE inflation of 2% to 2.5%. The PCE inflation rate has been half that level, worrying some that deflation could become a problem going forward. This is a problem that Europe is beginning to see. Education is half the battle -- learning about the factors affecting markets and thereby you. The other half of the battle is how you invest both your time and your money.